I thought with recent events we should have a place where we can come and watch great videos that put a smile on our faces. These video don't have to about horse racing or Zenyatta. They can be anything that you think will make someones day a little brighter, put a smile on there face or laugh. I sadly will start with a Zenyatta video because this one always makes me feel better when I watch it. Remember they don't have to be about horse racing. Beautiful video JJ, as for me... I've ALWAYS wanted to meet A.P. Indy, ever since I was a small child. So when I feel sad or lonely, I watch this video, and imagine myself there with him. Thanks so much for this JJ. I always smile when I watch the lady Z. Since I'm from NJ and I follow the Seattle Slew bloodline, here's a video where 2 fillies who are both descendants of Slew came in 1-2. But this video is also laughable because of the names of the fillies and the race call. 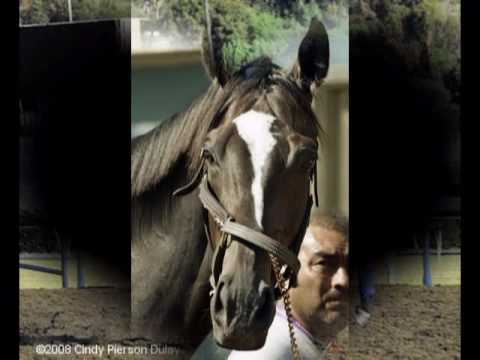 @Pati_Szpyra Zenyatta foal one really put a smile on my face I have never seen that before. I know that at the same time this one there was another where Zenyatta almost plowed into Z12. Is that one on Youtube? @slewpy I guess that video just proves that female in the relationship know everything. Love the reace calling. P.s Forget to menation above there is to be no bashing of any of the video on this discussion. If it does not make you laugh or smile don't comment because it made some laugh or smile enough to put it on here. I'm a big fan of hockey. I'm a season ticket holder for the ECHL Alaska Aces. Anyway, in 2010, the Belfast Giants hockey club (Belfast, Northern Ireland) put out this Christmas video. The song is sung by Mariah Carey and the hockey players did the dancing. It's two years old now and I still get a big kick out of it. Have you ever watch a video and laughed really hard but then you feel so bad for doing so. Well this video is one of those I laughed so hard but felt really bad about it. Don't worry I regain my sense and i feel for these poor ducklings. @Hockey_Buff all I have to say is lol lol my friend. LOL! Loved it, especially the name of the rabbit "Carrots on the Brain" & the William Tell Overture music at the end. Going to have to get that as a ringtone. Zenny will always make me smile...always. Thanks for all these videos. Zenyatta is a super girl. Here's one that puts a smile on my face. I love the JOY seen on the faces and especially the joy of the children. Enjoy--- It's wonderful. It Brought tears to my eyes to here these. 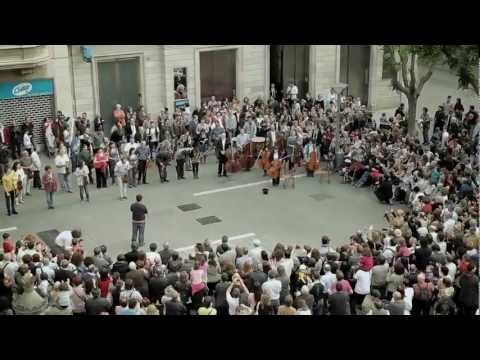 I love the flash mob video- it reinforces the need for the arts to be kept in the schools. Children respond to music. My daughter is a flutist, so I sent her this video to her with the admonition to watch it everytime she begins to wonder if all her hard work is worth it. Babies of all species are so cute. Check this one out. https://www.facebook.com/photo.php?v=505819052773774 Such hilarious amusement at such a simple action, you can't resist smiling at this one. Speakers on. who know tearing paper could make you laugh really hard. That was so cute. LauraJ! 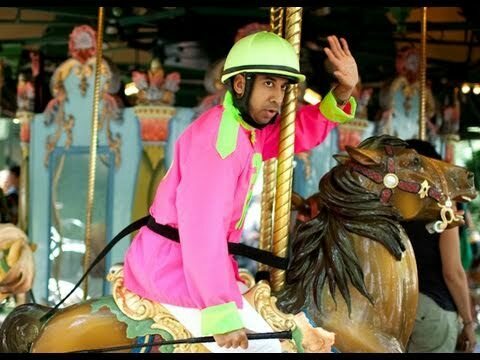 The carousel! My laugh lines are canyons!!! 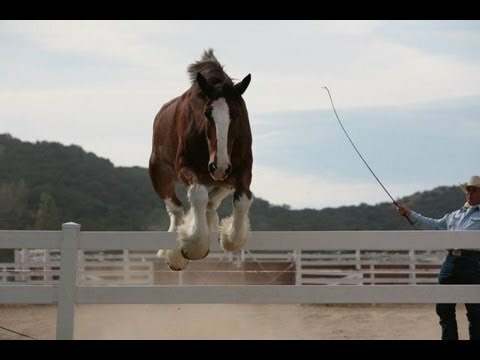 This one is fascinating--training the Budweiser Clydesdales for their Super Bowl commercials. i think i love clydesdales even more now O.O LOL the one on the track, wouldnt it be something to have clydesdale races xD think the track would have to be called Thunder Rumble. (CBS News) We've seen our fair share of "dog bites man" metaphorically here at The Feed. And while there is no biting in the above video (unless you count the leash), there is a dog. And a horse. And an attempt by the dog to take the horse on a walk. You've really got to see this one. Awwww... that is one seriously smart dog! And tell me that's not one of the cutest animal antic videos in the history of ever on the Internet. Just saying. The adorable overload clip was posted by YouTube user memorlandsto, and has this blogger wishing he had a dog and horse just like this odd-couple pair. What did you all think about it? As always, feel free to leave me some comment love below with your own unlikely animal pair experiences and thoughts.